One of the key challenges facing any theories of the molecular origins of life concerns the synthesis, stability polymerization and self-assembly of early life's molecular components. If you cannot explain the chemical origin of these components, you cannot really explain the origin of life. In case of life as we know it, this boils down to explaining the origin of the building blocks of living organisms, namely nucleotides and amino acids. The simplest principles and quirks of chemistry could have had an influence on how life could have evolved. A neat paper in ACS Chemical Biology offers a potential explanation based on basic organic chemistry for why a certain class of phosphorylated nucleotides formed in preference to others, even though 'conventional' organic chemistry would dictate the opposite. An anhydroarabinonucleoside has been postulated as an important potential precursor to further nucleotide synthesis. A key step is the phosphorylation of this nucleoside to yield an activated cyclic nucleoside phosphate. Having an activated molecule makes all the difference since activation primes the molecule to be attacked by further nucleophiles, thus triggering polymerization and growth. However, the phosphorylation of the arabinose nucleoside raises a fundamental question (hopefully) familiar to sophomore organic chemistry students. Why does phosphorylation take place preferentially on the secondary 3'-OH while sterically, as every student of organic chemistry knows, it should be preferred much more on the primary 5'-OH? To tackle this question, the authors get a crystal structure of the nucleoside in question. 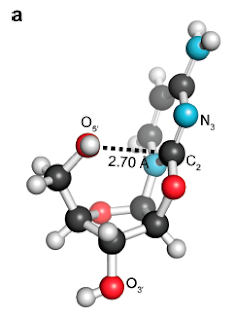 This x-ray structure shows an unusually short distance between the 2'-OH oxygen and the C2 carbon (2.7 A, a). Energy optimization using quantum chemical techniques surprisingly does not get rid of the short distance. Because of this proximity, the 2'-OH can undergo an internal attack on this carbon to generate a reactive intermediate (1), whose ring can be opened in turn by a 3'-OH phosphate to form the activated phosphate product. Now, the 5'-OH also gets phosphorylated; it's just that it cannot attack the C3 carbon of the activated intermediate the way the 2'-OH can because it's not in proximity to this carbon the way the 2'-OH is. The authors explain the short distance between the 2'-OH and the C3 carbon by postulating an interaction between the lone pair of the 2'-OH oxygen and the pi* orbital of the C2=N bond. This kind of interaction is quite familiar to organic chemists; it is invoked in the famous Burgi-Dunitz trajectory that enables nucleophilic attack on carbonyl carbons. Indeed, the authors perform a theoretical analysis that shows the angle of attack for the 2'-OH to be about a 100 degrees, close enough to the Burgi-Dunitz trajectory. This is a classic case of there being two competing pathways in chemistry, one of which is preferred to the other because of a subsequent low-energy route that can be traversed. It's a common theme in chemistry and biochemistry and illustrates how otherwise counter-intuitive reactions can be accelerated by putting them at the top of the right energy cliffs. No matter how complex life may be, it still cannot get around the basic laws of organic chemistry. Score one for thermodynamics. Interesting post to read, and perhaps such work might expect to the many asymmetries we see in biology. The subtle jibe towards biology is somewhat annoying to me though. Since the days of Pasteur, biology has all but abandoned the idea of a 'vital spirit', and we know that the basic laws of organic chemistry are at work here, of course. Biology does not subvert chemistry, it turns it into magic :) . As organic chemistry progresses as a science with regards to the molecules of biology, it will bring insights. This is score one for thermodynamiCISTS, for finally figuring it out. May I ask, what software did you use to post such beautiful picture of molecule above? The picture is from the paper and is quite nice. Are we still there? May I ask you a simple question?